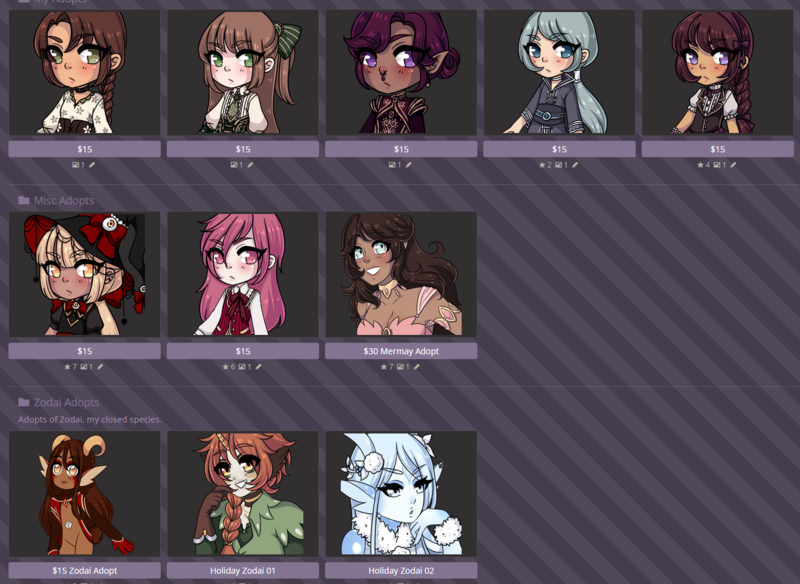 Here I'll be selling fantasy adopts I've made; all designs can be found in this folder. Edits can be requested for designs; color scheme changes are free, but anything that requires me to alter the existing design (hair, ears, etc) will cost an extra fee. All adopts are $15 base price, but on dA I typically sell them in Tiers for extra art, if desired. Tier 1 - $30 for your choice of a chibi or bust. Tier 2 - $40 for a fullbody. Tier 3 - $50 for a halfbody, fullbody, and chibi. All extra art is made after initial purchase of adoptable, and I will provide you with a form to fill out to detail character's gender, personality, etc. You can comment or PM me to claim! Ah i'm such a fan of your designs *w* good luck!! Added new designs. The $45 adopt comes with extra art. can i get this bab with tier 3?